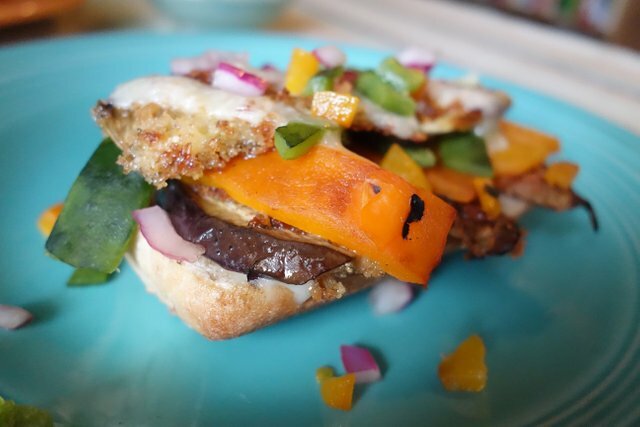 Amazing Open Face Eggplant and Peppers Sandwich, A KEEPER! I've been busy over here, but had to stop for a second to drop this amazing treat on you. It's vegetarian, which might make some of you happy, but if you're a carnivore, don't worry because you won't miss the meat at all. Trust me. 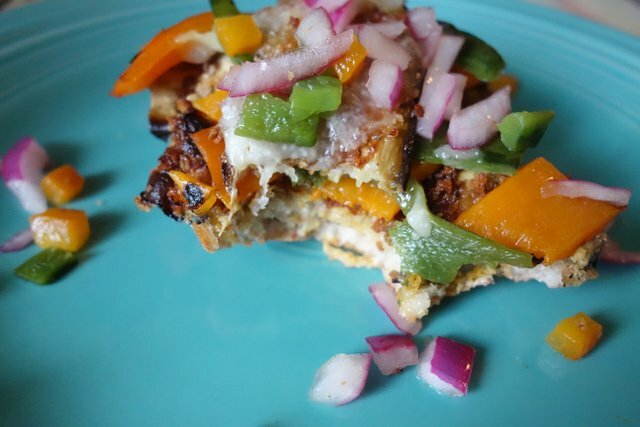 This is one of those amazing sandwiches that you can modify to your heart's content, but the main component is thinly sliced eggplant, from there you can go crazy and try any combination of veggie that is sliceable and able to stack. 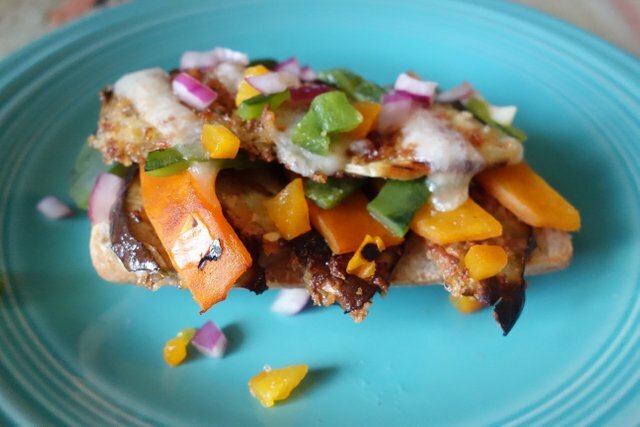 Start by using a mandolin to evenly and thinly slice your eggplant. Once sliced, lightly salt and set aside to let some of the liquid release. While that's sitting, prep your other veggies. I used an organge bellpepper and a pablano chili. Both of those were charred on the stovetop, the skins removed and sliced into strips. Back to the eggplant. Beat one egg and pull slices through the egg, then coat with panko. I put some dried oregano in my panko and it was a nice touch. 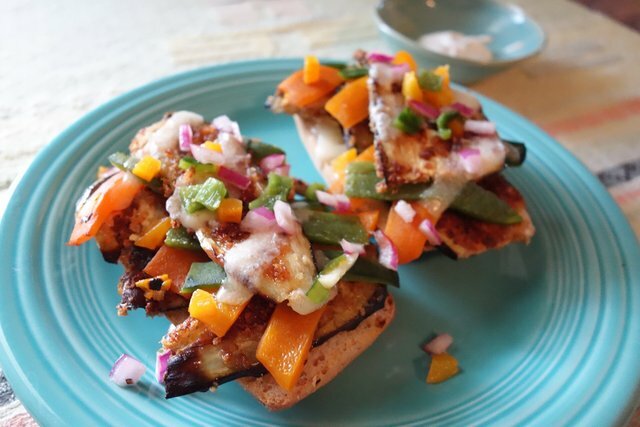 Once your eggplant is cooked through, both sides nicely browned, set aside. Keep the fire on medium or low so it won't burn, the eggplant takes a few minutes to cook all the way through, so be patient and cover for a couple of minutes if you need to to speed up the cooking process. I used store bought rolls for this sandwich and cut them in half, placing a layer of Asiago cheese on the bottom. Next layer was eggplant, then strips of bellpeper followed by the Poblano. If you add another layer of thinly cut cheese here, it will allow the final layer of eggplant to stay in place. Once your last layer of eggplant is in place, put a few thinly sliced pieces of the Asiago on top and place in oven for about 6-7 minutes. 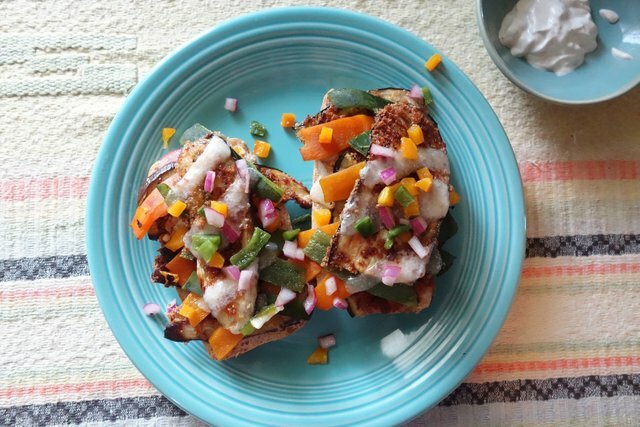 Once your sandwich is out of the oven, top with small diced cuts of the peppers to add some extra, colorful fun to the presentation. I also added some diced quick pickled red onion which added a nice contrast to the sweet orange pepper and the smokey Poblano. I also made a sour cream herb dressing, but the sandwich didn't need it and it wasn't even used. Now... EAT! This sandwich was truly scrumptious. So many wonderful flavors working harmoniously together and the satisfying light crunch of the Panko covered eggplant. This sammie has it all. I didn't have a beer, but a nice cold one would have gone really well with this any time meal. This is going to be a staple in my house this summer! Enjoy.